Syahrul Nizam Kamaruzzaman Building Surveying Department, Faculty of Built Environment, University Malaya, Kuala Lumpur, Malaysia. Atikah Razali Department of Building Surveying, Faculty of Built Environment, University Malaya, Kuala Lumpur. Malaysia is currently focusing on providing affordable housing all over the country as part of the plan to tackle the problem of rising costs of house ownership due to several reasons such as economic crisis and land limitations. However, there is a limited number of methodical study made on the residents’ feedback towards the indoor environment of an affordable housing. Indoor environmental quality (IEQ) is an important aspect of occupants’ wellbeing as it will affect their health and productivity. Thus, it is a paramount step in evaluating the residents’ feedback towards IEQ to serve as an indicator of building performance and condition. Additionally, the health and productivity of the residents should be evaluated in order to identify the effect of IEQ towards the occupants. The questionnaire survey is used in order to achieve the objectives and to gain the access to the respondents’ views and feedbacks. The pilot questionnaire study was conducted at two apartments in Kuala Lumpur, Malaysia and the data collected were evaluated and analyzed using the SPSS Software. The outcome of this pilot study is significant as it shows the residents dissatisfaction level towards IEQ factors such as noise, glare, and privacy, and the aspects of IEQ that are important such as ventilation. Additionally, it has been found that the IEQ of the residents does affect the health and productivity of the occupants. It is anticipated that the outcome of this study will serve as an indicator of building performance improvements to achieve a better quality of the indoor environment for affordable housing in Malaysia. Affordability is mainly defined as the relationship between a household’s expenditure and income (Musa et al., 2011; Menshawy et al., 2016). Affordable housing schemes have become a common method to deal with housing issues in the various housing markets in Malaysia. Affordability is perceived to be related to income, housing costs, housing availability, employment, maintenance of the existing affordable housing stock, and patterns of new construction. Affordable housing not only focuses on providing affordable shelter, but also on the quality of life of the occupants living in the dwelling. In the modern environment, housing policies have several objectives, and are rarely confined to a box labelled ‘housing’. They encompass, for example, macroeconomic and environmental objectives and reach into the territory of policies that come under such headings as ‘health’, ‘social exclusion’ and ‘urban regeneration’ (Winston, 2008; Houk et al, 2015). According to Baqutaya et al. (2016), the policy on housing is not only for housing access and affordability, but is also due to the effect of housing expenditure on inflation, growth and economic stability. Over the years, the Malaysian government has been providing affordable housing to help solve the housing issues in Malaysia, and according to their Eleventh Malaysian Plan (2016–2020), they are planning to increase the quantity of affordable housing and introduce housing schemes such as MyHome and RR1M. This is a positive development in Malaysia, not only for the welfare of the citizens, but also for the economy of the country and its developers. However, the increase in the quantity of affordable housing does not guarantee improvements in the quality of the indoor environment (IEQ), which commonly affects people’s comfort, health and productivity (Haghighat & Donnini, 1999; Lai et al., 2009; Frontczak & Wargocki, 2011; Al Horr et al., 2016). For example, one of the aspects of IEQ that influences residents’ well-being is the thermal comfort of the space, such as temperature and ventilation (Persily, 2015; Nimlyat & Kandar 2015). Despite the fact that the newly built buildings and housing are deemed to have satisfied the recommended standards, however, there are still complaints regarding their indoor environmental quality of the building and hosuing in Malaysia. The World Health Organization (WHO) recorded that in 1984 30% of ccurring buildings were subject to complaints concerning their IEQ. Dr Judith H. Heerwagen, an environmental psychologist, (as cited in Kolleeny, 2003) points out that several factors, such as exposure to daylight, air quality, temperature, odors, noise, ergonomics, opportunities for social gatherings, and relaxation, and exercise, affect residents’ productivity and well-being. The Environmental Protection Agency (1991) labelled this effect as sick building syndrome (SBS), whereby occupants experience acute health problems and discomfort only when they are in the building or space, and based on the time spent in the building. Therefore, buildings and space affect the well-being and productivity of the occupants residing in them. Hence, it is essential that the indoor environment of affordable housing is adequate for the health and productivity of the residents. Hashim (2010) points out that no specific studies or research have been conducted on affordable building, especially regarding the issues arising around it. Furthermore, the Malaysian government plans to continue the building of affordable housing in Malaysia in order to satisfy the demand for it, as well as to overcome the housing issues in the country. Therefore, it is important to investigate the IEQ of affordable housing in Malaysia to improve its quality. Moreover, it is critical that sustainable development results not just in resource conservation, but also in increasing productivity and residents’ well-being. This study hopes to inform the design community on residents’ perception of affordable housing performance based on the IEQ criteria. It will add to the growing body of research on sustainable design and residents’ perception of indoor environmental quality. For this pilot study, two affordable housing apartment area, located in Kuala Lumpur were selected and labelled as Apartment A and Apartment B. Both apartments are 17 stories high and are located close to public amenities and public transport, such as bus stations, LRT stations, and commuter stations. Both types of apartment consist of three bedrooms and two bathrooms; the units in Apartment A have floor areas ranging from 650 sq. ft. to 750 sq. ft., while those in Apartment B range from 616 sq. ft. to 650 sq. ft. The method used to conduct the pilot study was questionnaire survey. The convenience sampling method was used to distribute a total of 15 sets of questionnaires on each site. One of the purposes of the pilot study was to establish the clarity of the questionnaire as well as to improve it for the main study. Therefore, the number of targeted participants was limited. The survey was divided into three sections: Section A, Section B and Section C. Section A asked about the demographics and backgrounds of the respondents, Section B their health condition, while Section C asked questions about the respondents’ level of satisfaction with the IEQ factors, as well as about the level of importance of each factor. The questionnaire used a Likert 5-point scale in Section B and Section C, as shown in Table 4. · 1.9 km walk to Salak Selatan LRT Station. · 1.6 km walk to Bandar Tun Razak LRT Station. · 1.9 km walk to Salak Selatan Commuter Station. · 1.3 km walk to bus stop and taxi stand. · 1 km to commercial hub. · 7 km to Seremban Expressway; 13 km to KESAS Expressway. · 1.5 km walk to Salak Selatan LRT Station. · 1.7 km walk to Bandar Tun Razak LRT Station. · 1.3 km walk to Salak Selatan Commuter Station. · 1 km walk to bus stop and taxi stand. · 130 m to commercial hub. · 4 km to 10 km from Middle Ring Road II (MRR2) highways. The questionnaire was distributed by hand to the participants at the study sites, with a sample size of (n = 30), in January 2017. All thirty questionnaires were returned, which represented a 100% response rate. The Malaysian government has been taking initiatives to overcome the housing issues occuring in Malaysia by providing affordable housing for the citizens. This has resulted in an increasing demand for affordable housing units; consequently, the government plans to provide approximately 653,000 units, according to their Eleventh Malaysia Plan (2016–2020). Despite this positive development, the quality of this affordable housing is still unclear, specifically regarding the indoor environment. Therefore, this paper aimed to explore residents’ satisfaction level with the IEQ of their affordable housing, with the intention to provide an insight into the quality of the indoor environment and the factors that should be taken into consideration in future development of affordable housing. 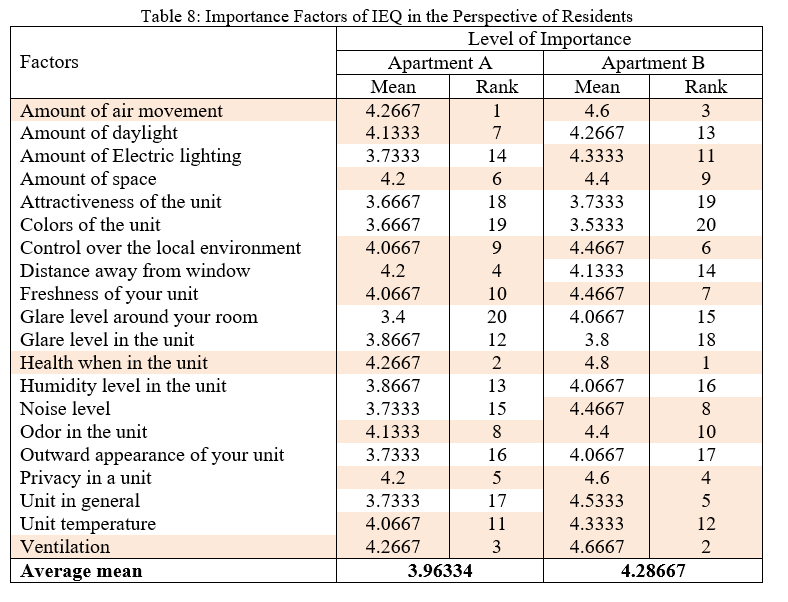 The study approached respondents with a questionnaire in two apartments in Kuala Lumpur in order to gauge their perspective on their health condition, satisfaction level, and the level of importance of the IEQ factors. The respondents from both apartments had the same distribution in terms of gender; however, other characteristics such as age and household size varied. From the questionnaire, it was found that the residents in Apartment A and Apartment B experienced sick building syndrome (SBS) symptoms. The most severe symptoms experienced by both sets of residents were fatigue, dryness and irritation of the throat, dizziness and sleep disturbance. Furthermore, those in Apartment B suffered psychological health problems such as stress and anxiety. Those living in both Apartment A and Apartment B were dissatisfied with the noise level and privacy, as well as the glare in their unit. More importantly, they rated ventilation, air flow, health and privacy in their unit as the important IEQ factors from their perspective. Their dissatisfaction, as well as the importance of the IEQ factors, might be influenced by the surrounding of the apartments, as both are located in areas of high transportation density and high circulation in public access areas. These two contributing factors eventually influence the indoor environment of the units. Based on this pilot study, the quality of IEQ in Malaysia is inadequate and needs to be improved in future development of affordable housing. Insufficient IEQ contributes to residents’ discomfort and exposes them to severe sickness and symptoms, reducing their productivity and health. Several important IEQ factors such as ventilation need to be stressed and considered during the design process of housing. Furthermore, other contributing factors such as location also need to be considered during the development of affordable housing in Malaysia. In conclusion, it is expected that the main study will show that the health of the residents in the affordable housing units is affected by the IEQ of their apartments, due to SBS symptoms. Moreover, it is anticipated that there are residents who are dissatisfied with several IEQ factors and their effect on them. The external factors that influence the IEQ should also be identified in the main study. This research was funded and supported by UMRG (RP015E-15SUS), University Malaya, Research Grant, Sustainability Science Research Cluster.